The Internet of Things is opening up a world of opportunities for everyone from connected cars to connected healthcare to smart cities and even home automation. The World Economic Forum estimates that by 2020, about 50 billion things will be connected. In short, the Internet of Things adds an entirely new dimension to transform governments, businesses and societies and advancing humanity in ways we cannot yet imagine. The Internet of Things provides the businesses a chance to transform business operations and introduce new business models to provide unprecedented levels of customer service and to innovate products, services and revenue models. Businesses will do this by adopting big data tools, cloud computing, and mobile technology and of innovations in a highly networked economy. Every business process can be enabled and therefore several industries redesign their business models and processes along Internet of Things (IoT) paradigm. To maximize the social and economic benefit of the technology, issues of interoperability, mashing up data, developing open platforms and standardization across technology layers have to be addressed. 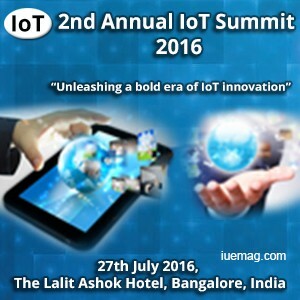 This 2nd Annual IoT Summit 2016, is a powerful and inspirational event that brings together industry representatives, makers, vendors, experts, developers and others to plan, learn, network, collaborate, strategize and more effectively tap into the immense potential of the IoT domain. The conference will be held on 27th July 2016, The Lalit Ashok Hotel, Bangalore, India. Any facts, figures or references stated here are made by the author & don't reflect the endorsement of iU at all times unless otherwise drafted by official staff at iU. This article was first published here on 2nd June 2016.